Christopher Nolan’s Interstellar is as audacious and densely packed as any other film that the director has crafted so far in his career. Over its near three-hour run time, Nolan keeps the screen busy with truly awe-inspiring images and a narrative that constantly presses forward boldly, like the pioneering astronauts at its center. While it has clear influences from notable predecessors like 2001: A Space Odyssey and Solaris, Interstellar works hard to develop its own path and bring new ideas to the table. What it lacks in compelling character motivation, it more than makes up for with heady scientific topics and visionary action set pieces. The film places us in a future ravaged by environmental instability and economic turmoil. 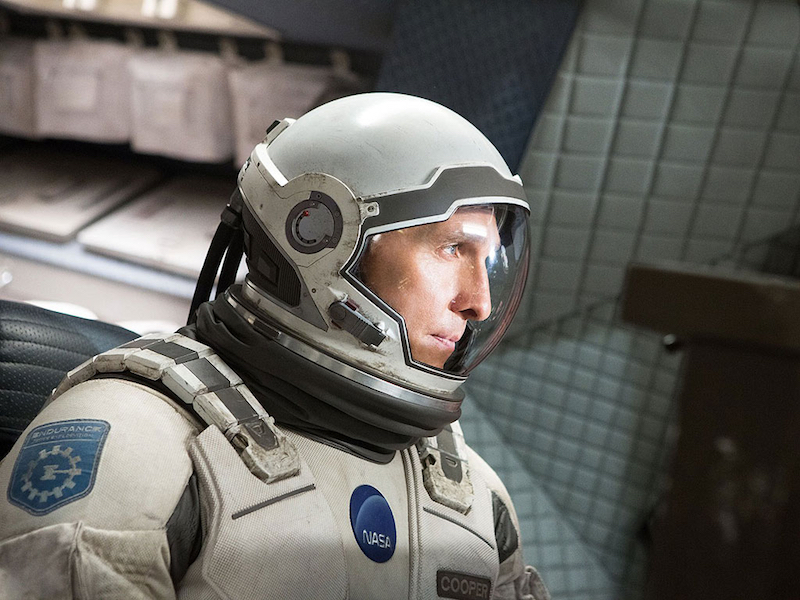 Matthew McConaughey plays Cooper, a widowed father (in case you weren’t sure this was a Christopher Nolan movie) of two and an engineer-turned-farmer who is recruited under mysterious circumstances to the nigh-defunct NASA. There he is convinced by Professor Brand, played by Michael Caine, and his daughter Amelia, played by Anne Hathaway, to embark on a journey through a recently discovered wormhole near Saturn in order to seek out life-sustaining planets and ensure the ongoing survival of the entire human race. The details of the ensuing mission and their effects on both the earthbound and space traveling characters are aspects that are difficult to discuss without unraveling the entire plot of the film. It would suffice to say that the film tries valiantly to cover as much ground as possible and it succeeds more often than it fails. The pacing is uneven but determined and the acting, particularly by a well-cast McConaughey, is consistently grounded. The film’s best sequence has two characters reeling from an hour long journey to a planet severely affected by time dilation, who return to find that 23 years have passed in their absence. From a technical perspective, Nolan and his crew have created another IMAX presentation that is nothing short of extraordinary. Seeing this film in 70mm IMAX was an exhilarating sensory experience, one of the most memorable that I’ve been a part of personally. I was struck not only by the grandeur of the visuals but the detail of the sound design. Scenes of a shuttle taking off or traveling through a wormhole have even more impact when played through a speaker system capable of producing low frequencies that you can literally feel in your body through the vibrations in the theater. Another aid to the sound of Interstellar is a reverent and spellbinding musical score by Hans Zimmer that simultaneously captures the wonder and dread of space exploration. It is only detrimental during some higher action scenes where it can bury some of the characters’ dialogue, although these instances were not crucial in the long run. Ultimately, Interstellar is about as ambitious as big budget pictures are allowed to be these days and Christopher Nolan has again proven himself to be one of the most talented directors in his class.